In 1891, James Ensor executed a work in oil paint, black pencil and charcoal on a mahogany wood panel entitled, Gilles and Sauvage. The painting's measurements are 12 x 16 cm. The painting is signed at the lower right and is titled and dated by the artist on the verso. (1) Because of the sparsely employed oil paint and the contours in pencil or charcoal of the silhouettes makes the work seem more like a enhanced drawing rather than an oil painting. Gilles and Sauvage refer to figures from the late-Medieval folk theatre (cluyten), such as Valentin and Ourson, the 'wild man/savage'. These two personages are the subject of a drawing by Pieter Brueghel the Elder and of an anonymous print after Brueghel from 1566. The scene is found back in Brueghel's painting The Fight Between Carnival and Lent (1559, Vienna, Kunsthistorisches Museum). (10) Ensor often was inspired by Brueghel in content and stylistics, such as in the paintings, inter alia, The Sermon of St. Babylas (1892, current whereabouts unknown) and The Execution (1893, Hamburg, Kunsthalle, in long-term loan by Klaus Hegewisch). (11) In addition, the grotesque and carnavalesque figures from François Rabelais' Pantagruel and Gargantua could have inspired Ensor. In his many writings he sings the praises of Brueghel and Rabelais. 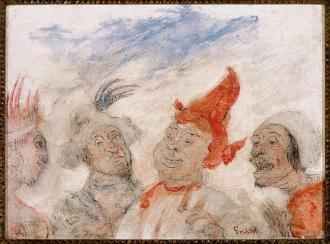 The question of why James Ensor painted this scene, however, remains unanswered. What were his sources? Did he receive information about 'Denis' and 'Sauvage' from third-party members? Who are the two other figures in the painting? The pesonage, furthest left in the composition, brings to mind the figure of an "Indian". The tableau appears to depict the folk figure "Gilles" and the "Noble Savage". That the painter had an interest for historical and legendary subjects around 1890 is witnessed by various oil paintings on panel, such as The Remorse of the Ogre of Corsica (1890/1891, private collection), Auto-da-fé (or Philip II in Hell) (1891, private collection) and The Sermon of St. Babylas (1892, current whereabouts unknown), and prints such as Iston, Pouffamatus, Cracozie and Transmouff, Celebrated Persian Physicians, Examining the Stools of King Darius after the Battle of Arbela. (1886, Ghent, Museum of Fine Arts), Queen Parysatis (1899, Ghent, Museum of Fine Arts) and the Battle of the Golden Spurs (1895, Ghent, Museum of Fine Arts). James Ensor owned an extensive and varied library, which he partially inherited from his father. He drew a great deal of inspiration from numerous literary, scientific and historical books. Thanks to his friendship with, among others, Eugène Demolder, Théo Hannon and Ernest Rousseau, the artist could enlarge his intellectual horizon and expand his knowledge within the human sciences. It is not inconceivable that the realisation of Gilles and Sauvage was initiated during or after a conversation with one of the many intellectuals he had met in Brussels at the home of Ernest Rousseau, Rector of the Université Libre de Bruxelles (Free University of Brussels). The painting, Gilles and Sauvage, is situated in the series of small oil paintings on panel that Ensor completed between 1890 and 1895. Just as with Mr. and Mrs. Rousseau Speaking with Sopie Yoteko of 1892 (private collection), it is about an 'enigmatic' painting. (12) It appears that during this period Ensor took pleasure in depicting cryptic subjects of which the meaning is not clear. Xavier Tricot, James Ensor. The Complete Paintings, Ostfildern, Hatje Cantz, 2009, p. 312, no. 338. In 1544, the work was published by the Les Angeliers brothers in Paris with the title: Les très elegantes et copieuses annales des très preux, très nobles, très chretiens et excellents moderateurs des belliqueuses Gaules. Depuis la triste desolation de la très sainte et fameuse cite de Troie jusques au regne du très vertueux roi Francois a present regnant: compilees par feu très eloquant et noble historiographe en son vivant judiciaire et secretaire du Roi controleur de son tresor Maître Nicole Gille, jusqu'au temps du très prudent et victorieux Roi Louis douzieme. Et depuis additionnees selon les modernes historiens nouvellement revues et corrigees outre les precedentes impressions. In 1553, Jean Macé published an actualised version of Chronique et Annales de France entitled: Les Annales et croniques de France, jadis composées par feu maistre Nicole Gilles, imprimées nouvellement sur la correction du signeur Denis Sauvage, et additionnées jusques à cest an mil cinq cens cinquante trois. Dirk Martens was first active in Antwerp and then later in Leuven. It is not clear if Pauli Sententiae Receptae is also printed by Dirk Martens. I want to heartily thank Ms. Kathleen Leys, adjunct-conservator of the Erasmus House in Brussels for this information. See A. De Bosque, Quinten Metsys, Brussels, Arcade, 1975, p. 378, ill. nr. 296. For a biography of Pieter Gillis, see, inter alia, M. De Schepper, 'Pieter Gillis (1486-1533), Antwerpse humanist en vriend van Erasmus', in: Miscellanea Jean-Pierre Van den Branden, Erasmus ab Anderlaco, Archive and Library entities of Belgium, extra number 49, 1995, pp. 283-295; Joris Tulkens, De verloren droom van Pieter Gillis, Leuven, Davidsfonds, 2010. See Marc Boone and Maurice Vandermaesen, A l'ombre du pouvoir. Les entourages princiers au Moyen Age, Liège, Bibliothèque de la Faculté de Philosophie et Lettres de l'Université de Liège, 2003, passim. See A. De Bosque, op.cit. Philippe & Françoise Roberts-Jones, Pierre Bruegel l'Ancien, Paris, Flammarion, p. 75, ill. nr. 87. Xavier Tricot, op. cit., p. 318, nr. 359 and p. 319, nr. 363. Xavier Tricot, op. cit., pp. 317-318, nr. 355. For the meaning of the name 'Sophie Yoteko', see: Patrick Florizoone in the exhibition catalogue James Ensor, Frankfurt, Schirn Kunsthalle, 2005-2006, p. 222. It is possible that Ensor also referred to the Kagura Masks Yottoko (or Hyottoko) that was used in the Japanese Dengaku dance theatre. This character type functions there as the fool.